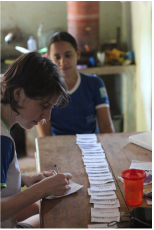 In 2012, I started an ongoing research project in rural Para state, Brazil, that explores the cultural value of local and imported foods, how food insecurity shapes people's access to those foods, and how those factors shape physical and mental health. It is part of an NSF-funded multi-site study with colleagues at Emory University and ﻿Duke University﻿ that compares food insecurity, mental health, and nutritional status in Brazil, Ethiopia, and Haiti. Do people stigmatize some foods as "poor people's foods"? Do food insecure people eat more of these foods? Do food insecure people experience undernutrition? Do food insecure people modify not only what they eat, but how they eat it? Do food insecure people experience poor mental health because of the social stigma surrounding the foods they eat, the nutritional deficiencies they may experience, or some combination of these? Please visit my publications section for more information on the results of the project so far.